Praise indeed for my “Happy to Share” cards, Age UK have put them on their Facebook page and in just over 24 hours they have had 968 reactions, 101 comments, and 493 shares! Wowzer! 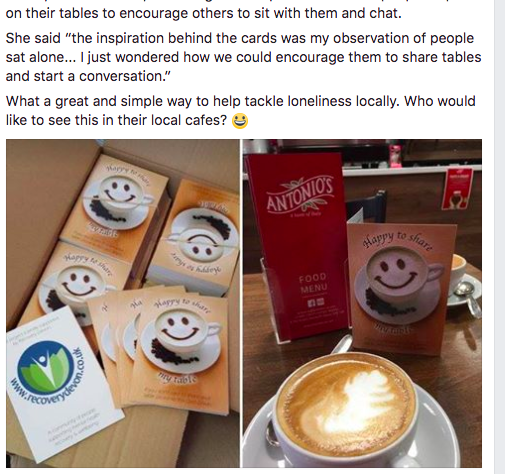 “A former carer is tackling loneliness by planting ‘Happy To Share’ table cards in cafés across Devon. 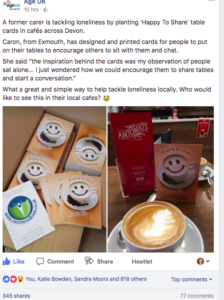 Caron, from Exmouth, has designed and printed cards for people to put on their tables to encourage others to sit with them and chat.